When we got to cousin Benny's house in Vermont on last Friday afternoon, cousin Benny was so excited showing his house and his back yard. His house is a neat old green house. There are flowers and vegetables garden in the back yard. And something caught my eyes ... there was a river and a dam right beyond the garden! Wow ... incredible! 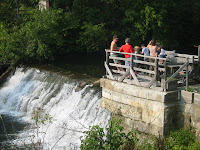 The backyard was really beautiful with the Winooski River, dam and gardens all making a great view. Early in the morning we all except Katy (cousin Benny's wife), took a walk around the neighborhood. Lindsey, my husband's sister, came to have breakfast with us ... yay! In the afternoon Lindsey, Gussy (cousin Benny's daughter), Benny (my son), and I went to town called Montpelier for sightseeing. After we got some toys for the kids and had lunch we went to Katy's bookstore in Northfield. Gus (my husband), Thia (my daughter), cousin Benny, and his other daughter, Jeannie, met us there. Benny and Gus got books and guess what ... I got one too! I've never been a big fan of reading books, everyone knows that. But I have changed, and I always like to try new things. I got "The Other Boleyn Girl" by Philippa Gregory. I will talk about it next time for sure. Then we went swimming in a swimming hole near Northfield. Everybody swam except Gus and I, because we forgot to bring our bathing suits. They all had fun swimming, Thia didn't even want to stop. My son, Benny, was disappointed when we had to leave the swimming hole.